The consolidated global tin market is dominated by three leading companies, namely Malaysia Smelting Corporation, Yunnan Tin Group Company Ltd., and PT Timah (Perseo) Tbk. These three companies collectively account for a stable majority share in the global tin market and are likely to retain their dominance through the forecast period. The other half of the global tin market, though, is relatively fragmented, with several regional and application-specific dealers occupying key shares. According to Transparency Market Research (TMR), Yunnan Tin Group Company Ltd. was the largest company in the global tin market in 2014 in terms of revenue. By production, Malaysia Smelting Corporation beat Yunnan Tin Group Company Ltd. to the top spot and is likely to remain the leader in tin production in the coming years. 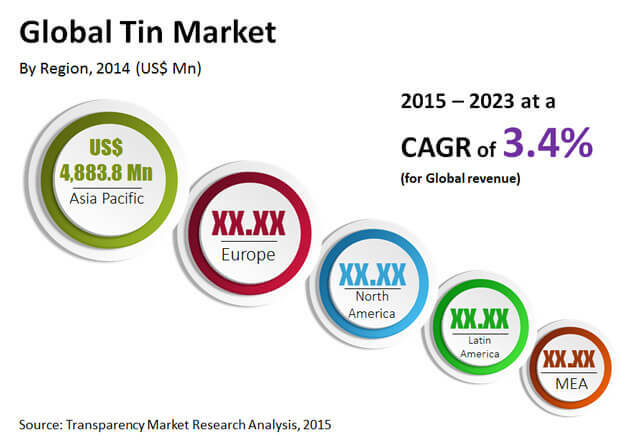 The global tin market is expected to exhibit steady growth in the coming years. Nevertheless, the impact of key restraints such as the rising scarcity of raw material could destabilize the global tin market. According to TMR, the global tin market is likely to rise to a valuation of US$7.3 bn by 2023, expanding at a moderate CAGR of 3.4% and 2.5% by revenue and volume, respectively. The presence of large tin ore mines in Asia Pacific has strengthened the region’s position in the global tin market and is likely to ensure steady growth of the regional tin market in the coming years. Southeast Asian countries such as China and Malaysia are likely to remain among the leading producers of tin in the global market. The Asia Pacific tin market is expected to account for more than two-thirds of the global tin market in the coming years. Latin America is also likely to feature prominently in the global tin market in the coming years due to the rising demand for tin from the region’s developing countries. The rapid urbanization in countries such as Mexico, Brazil, and Argentina is thus likely to be a major driver for the global tin market. On the other hand, the global tin market faces a key roadblock in the form of the declining levels of ore in tin mines across the world. Due to consistent tin mining in major producers, several large mines are on the way of exhaustion. The Latin America tin market is among the most badly hit by this concern. The global tin market derives a major share in its revenue from the consumer electronics and food and beverage industries. In the case of the latter, the demand from the global tin market has been propelled primarily by the rising demand for packaged food, which has led to a rising demand for tin foil and other packaging materials. The rising demand for packaged food from urban centers across the world is likely to make this an influential driver for the global tin market, with the Asia Pacific tin market likely to gain substantially from the rising demand for packaged food in the region’s emerging economies. The leading application segment of the global tin market is soldering, as tin is a crucial element in soldering devices. The rising consumer electronics industry has thus become a key driver for the global tin market, as soldering is an essential requirement for maintaining the expected build quality in today’s highly competitive consumer electronics industry. The rising pricing pressure in the global smartphone market is likely to drive the demand from the global tin market, as reliability of the mechanical equipment is now considered a key factor by most consumers.